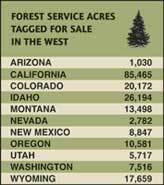 Last year, the Forest Service sold 605 acres nationwide. Under the president's new proposal, up to 200,000 acres could be sold over the next five years. Thousands of acres of public land may soon be up for grabs if two proposals in President Bush’s 2007 budget make it through Congress. Released Feb. 6, the budget directs the U.S. Forest Service and Bureau of Land Management to generate more than $1 billion by selling off parcels of land. The proposals come little more than two months after a high-profile move by Rep. Richard Pombo, R-Calif., and Rep. Jim Gibbons, R-Nev., to sell off millions of acres of public land under the 1872 Mining Act. That effort was beaten back by bipartisan opposition from lawmakers and conservation and outdoor groups (HCN, 12/26/05: Bipartisan uprising sinks public-lands selloff). Of the two proposals, the Forest Service’s has drawn the most attention. It would generate $800 million to fund the Secure Rural Schools and Community Self-Determination Act of 2000, which over the past five years has paid out about $2 billion for schools and other services in counties strapped by the decline in federal timber sales. The act expires this September; both Republicans and Democrats say its funding needs to be extended. Yet even as lawmakers from both parties sponsor legislation to fund the schools act through a different source, environmental groups remain concerned. They say the administration’s proposal backs lawmakers and the public into a corner. "They’re forcing people into this untenable situation, where in order to protect public lands, they have to say ‘no’ to schoolchildren," says Janine Blaeloch, executive director of the nonprofit Western Lands Project. "It diverts attention from their real agenda, which is privatizing public land." Opponents say many acres on the Forest Service’s list shouldn’t be there. One example, in Montana’s Bitterroot Valley, is the Willoughby 40, where a popular nature trail winds through ponderosa pines at the foot of the Sapphire Mountains. Local schools use the property — with its picnic area, parking and restroom — for field trips. Yet it lies outside the main national forest boundary, so it’s been tagged for sale. Also on the list, environmental groups say, are remote river canyons, roadless areas, hunting and fishing lands, and prime wildlife habitat. But there is no way to field-check the proposed 300,000 acres in 30 days, environmental groups say. The public comment deadline in late March will be long past when the snow has melted and people can reach many higher elevation parcels, says Stephanie Tidwell of the Klamath-Siskiyou Wildlands Center. Opponents concede that some of these Forest Service lands are a hassle to manage, but argue that if the agency is getting rid of them, it should at least get some lands in return. The lands for sale are some of the agency’s best "trade bait," they say, and auctioning them off could undermine the Forest Service’s ability to swap for lands that would be more valuable in the long term. As for the BLM proposal, the problem is not only the sale, but also where the money will go. Seventy percent of the BLM’s general land-sale proceeds would be funneled away from land acquisition, where they're currently used, and into the general treasury. "It’s public-land liquidation for deficit reduction," says David Alberswerth, senior policy advisor for The Wilderness Society. The BLM proposal does not target money raised by land sales around Las Vegas. Since 1998, those sales have raised $2.75 billion for land acquisition and park and trail construction in southern Nevada. The Bush administration tried, unsuccessfully, to grab 70 percent of that money for the treasury in last year’s budget proposal (HCN, 3/21/05: Nevada desert to be sold for debt relief). Montana Gov. Brian Schweitzer thinks that both of this year’s proposals — the Forest Service’s and the BLM’s — are headed for the political graveyard. "If we sold off a piece of land every time we needed to raise money, we wouldn’t have any public land left," he says. "Maybe just the parking lot in front of the Capitol building." www.fs.fed.us has more information. The public comment deadline is March 30.